Kvaser Hybrid Pro 2xCAN/LIN is a flexible, dual channel interface that allows each channel to be assigned independently as CAN, CAN FD or LIN. The Kvaser Hybrid Pro 2xCAN/LIN offers advanced features such as support for CAN FD (both ISO and non-ISO), Silent Mode, Single Shot, Error Frame Generation and Kvaser MagiSync automatic clock synchronization. The device can host user-developed programs (T-scripts) which enable user to realize advanced tasks such as CAN node simulation and CAN flashing, or create a LIN to CAN gateway. Each channel has galvanic isolation, and selection between CAN/CAN-FD/LIN is done just by software. 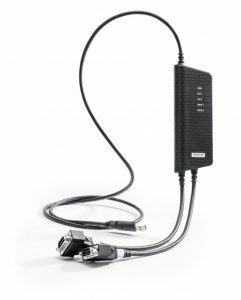 This makes the Kvaser Hybrid Pro 2xCAN/LIN a must-have ’universal interface’ for every engineer involved in automotive communications! The CAN FD, CAN with Flexible Data-Rate, is a protocol based on the CAN bus. The CAN FD provides for higher baud rates and up to 64 databytes per frame. This leads to faster transmission and lower bus utilization.